The state of Alabama has more than 60 colleges and universities, a dozen of which are located in the capital city of Montgomery alone. Nearly 60,000 students are enrolled in Alabama’s private colleges, and close to another 250,000 are enrolled in public and state schools. As a college-bound student researching schools in Alabama the big question is: which college or university should I choose, and why? Find out more about the online college options in Alabama, get answers to frequently asked questions on tuition and learn how a college education can set you up for career success below. For this year's college rankings, our analysts carefully reviewed statistical data from multiple sources for 7,521 colleges and universities so that you could easily evaluate schools based on what matters most to you. For each school, we applied the eligibility criteria outlined below, then ranked schools and programs based on four ranking factors. Dozens of data points were used to calculate an overall score for the four ranking factors above. For quality, the most impactful data points were acceptance and graduation rates; for affordability, tuition2 and grants; for flexibility, part-time enrollment offerings; and for program, degrees granted in that specific program area. Each score was then weighted, with quality being the most important consideration for all AS Online rankings. Tuition displayed is in-state and per year unless stated otherwise. First established in 1831, the University of Alabama supports the next generation of students by offering a variety of online and blended programs. Choose from degrees in a range of fields such as criminal justice, business administration, marketing, journalism, hospitality management, nursing and education. Most undergraduate programs require about 120 credit hours for completion, while many master's degree programs require 30-36. The university is accredited by the Commission on Colleges of the Southern Association of Colleges and Schools (SACSOC). The University of Alabama at Birmingham provides a broad range of online and blended programs for undergraduate and graduate degrees, as well as academic certificates and continuing education courses. These programs are designed to help students launch or advance their careers in accounting, finance, human resource management, psychology, criminal justice, education, engineering, health care, and many other dynamic fields. Graduation requirements and the length of programs vary. For example, the Clinical Doctorate in Occupational Therapy allows students to take 1 or 2 courses a semester, with a total of 40 credit hours needed for completion. Some programs require on-campus intensives, such as the Executive DSc in Administration-Health Services, which requires 3 8-day on-campus intensives each year, for a total of 3 years. The Oncology Nurse Practitioner subspecialty is another program that involves multi day intensives, but only two are required in this case. The university is accredited by the SACSOC. Auburn University offers online programs at the undergraduate and graduate level, which target a variety of career paths including computer science, agriculture, business, education, engineering and nutrition. Most online bachelor's programs are designed for students seeking a second degree or degree completion. Many online master's degree programs require a minimum of 30 credit hours. Online professional credit and personal enrichment programs are also available. Auburn University is accredited by the Southern Association of Colleges and Schools (SACS). A pioneer in online learning for 20 years, Troy University provides a large number of online and blended degree programs for undergraduate and graduate students, in addition to continuing education courses and certificates. Examples of popular online programs include adult education, applied computer science, business, criminal justice and psychology. A number of concentrations are also available to allow you to specialize; examples include sports management, which is a concentration available in the hospitality, sport and tourism management bachelor's degree program, and international politics, a concentration in the political science bachelor's degree program. Specific credit requirements differ by program. Troy University is accredited by the SACSCOC. To boost student access to quality education, the University of Alabama in Huntsville (UAH) provides 21 online and hybrid programs for undergrads and grad students. UAH offers certificates and bachelor completion programs on up to PhDs. UAH helps prepare students for a diverse range of careers in fields such as supply chain & logistics management, elementary education, industrial engineering, cybersecurity, nursing and other in-demand fields. Some courses are 100% online, while others require some on-campus meetings. UAH is accredited by the SACSCOC. Focused on Biblical theology and spiritual growth, Heritage Christian University teaches students how to serve in ministry. The same degrees that are offered on-campus are also available online, though distance-learning students should plan to visit campus periodically to take exams or attend other key events. Program offerings range from an Associate of Arts in Biblical Studies to a Master of Divinity. Heritage Christian University is accredited by the Commission on Accreditation of the Association for Biblical Higher Education. At Jacksonville State University (JSU), a host of degree programs are available online to equip students with the knowledge and skills needed for careers in engineering, business, computer science, criminal justice, education, emergency management, nursing and public administration, to name a few examples. Online learning at JSU is 100% web-based. Credit requirements and program length varies; for example, the M.S. in Computer Systems requires 30 credit hours, while the B.A. in Integrated Studies requires 120 credit hours. JSU is accredited by the SACSCOC. A private university with a Christian mission, Samford University meets the needs of contemporary learners with a variety of online and blended degree programs. The school offers one online bachelor's program and 18 graduate programs, including business administration, environmental management, health administration, nutrition, public health and law, to name a few. The length and requirements of each program varies; some programs require internships or clinical experiences. Full-time and part-time options are often available. The university is accredited by the SACSCOC. Established in 1838, a Judson College is a private Christian college that offers online bachelor's degree programs for non-traditional adult students. Although Judson's residential programs are only for women, its distance education programs are open to anyone. Each online course is self-paced and lasts 2 to 4 months. Students must complete 128 semester hours or more. Majors include business administration, criminal justice, elementary education, music and other subjects in the liberal arts. Judson is accredited by the SACSCOC. More than 50 online degree programs are offered by the University of West Alabama, including bachelor's, master's, doctorate and certificate programs. Choose from a wide range of programs to take the next step in your career and pursue opportunities in business, communications, psychology and counseling, public safety school administration, teaching or conservation biology. The school's 8-week courses are fully online and feature smaller class sizes. Program length and requirements vary. The university is accredited by the SACSCOC. How can I find which online colleges offer the degree I’m looking for in Alabama? Online colleges in Alabama offer degrees ranging from associate-level to doctoral degrees, and the best way to find if your degree of choice is offered is to connect with the schools you are interested in. The Alabama Commission on Higher Education offers a directory of all schools in the state, as well as an interactive map of the state with each college and university. Programs are constantly changing, upgrading and merging—contacting a school directly is the best way to get the most up-to-date course and major information. Many schools also offer a listing of their online program selections on their website, such as the University of Alabama Bama by Distance program page. There are many schools in Alabama known for offering a broad range of undergraduate degrees, including academic certificates, pre-professional degrees or minors online, like the University of Alabama at Birmingham. This type of school can be a great option for those who may not necessarily know what career paths they would like to take. Which online schools in Alabama will accept my transfer credits or work/life experience? Whether online universities in Alabama accept students’ transfer credits or work/life experience is decided case by case. The criteria for qualifying for these benefits are extremely specific. For example, the University of Alabama has a LifeTrack program where students can transfer credits from other institutions that are accredited, as well as earn credits through previous learning portfolios. In addition, multiple Alabama Community College System institutions accept life experience and transfer credits toward degrees. How Much More Do College Grads in Alabama Make? Students constantly hear that earning a college degree will lead to higher salaries long-term, and statistics show this to be true in the state of Alabama. Here’s a look at the average pay that professionals in Alabama earn based on career and industry degree level requirements. One discrepancy to the general uptick in salary for jobs requiring advanced degrees in Alabama are those at the master’s degree level—careers that require a master’s level education tend to pay slightly less per year than those that only require a bachelor’s degree. However, Alabama residents who work in jobs that require a doctoral or professional degree may make $80,000 more per year than their peers working in jobs that require no formal education, and roughly $40,000 more than those working in fields and industries that require a bachelor’s degree. Sectors oriented towards social assistance and health care have witnessed especially high-demand over the past several years in Alabama, along with sales occupations, food preparation and service, administrative office support and waste management. Alabama’s most quickly growing occupations include those related to math and computers as well as health care support, which includes the work of veterinary technicians and home health aides. As students in Alabama seek a more flexible way to earn a college degree, they should be aware they do not have to sacrifice quality for convenience. It is critical that students choose schools that are regionally or nationally accredited, as accreditation demonstrates a college’s commitment to keeping up with rigorous academic quality standards. Accreditation varies by school, and Alabama’s colleges and universities carry a variety of accreditations, most often on the regional or national level. For example, Alabama A & M University is accredited by the Southern Association of Colleges and Schools, Commission on Colleges, or the SACS/CC. The SACS/CC is the regional accreditation body for Alabama and accredits both traditional programs and online programs at colleges and universities in the state. Some colleges in Alabama may not necessarily be regionally accredited but instead might be nationally accredited. For instance, Columbia Southern University is accredited by the Distance Education Accrediting Commission, or the DEAC. 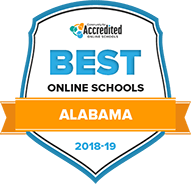 In addition to being regionally or nationally accredited, leading online colleges in Alabama may also provide subject-specific accreditation for various programs. For example, Athens State University’s College of Education is accredited by the National Council for Accreditation of Teacher Education, or the NCATE. They also offer multiple online degree options. Flat Online Cost Per Credit: The University of West Alabama’s advertises online costs per credit as the same, no matter where an online student is located. Online Cost Per Credit, In-State vs. Out-of-State: At Troy University, students who would pay out-of-state tuition rates to attend an Alabama campus will be charged twice the tuition rate if they take courses online. Specific Online Program Tuition Rates: Some programs within the University of Alabama in Huntsville system, especially graduate-level courses, vary by program specialty. Summer, Evening & Weekend Tuition Rates: The University of Alabama, Bama by Distance program offers part-time student rates that do not include activity, recreation or athletic event privileges. Alabama residents may want to look into a program called the Academic Common Market, which is a product of the Southern Regional Education Board and gives the state’s residents access to various degrees at out-of-state schools for in-state tuition rates. Through this program, Alabama students can take advantage of degree programs in 15 southern states and pay in-state tuition rates. Here are a couple of frequently asked questions about paying for online colleges in Alabama. What are Alabama’s requirements to qualify for in-state university tuition? In Alabama, students must have lived in the state for a minimum of one year before they can be deemed residents. In addition, Alabama residents who move to other states are no longer considered to be state residents. Moving to Alabama just to attend school in the state will not enable a student to qualify for state residency. However, if a student works for 90 days or more in Alabama before submitting an application for school, this student is deemed a resident of Alabama for the purpose of tuition; however, temporary work doesn’t count. Most importantly: Online students in Alabama should learn whether or not their school of choice requires residency to receive in-state tuition rates for online programs. Are online credits more affordable in Alabama than other places? Online students may find that colleges in Alabama are more affordable than the national average, but numbers vary by school. Average in-state tuition costs at Alabama’s public, four-year colleges and universities are middle-of-the-road, lower than 25 other states, including nearby southern neighbors South Carolina and Kentucky. Small colleges in Alabama, such as Athens State University ($290 per online course in 2017-2018) may beat undergraduate tuition rates for similarly sized Gordon State University in neighboring Georgia ($159 per online credit in 2017-2018). But simply looking at the numbers isn’t enough to get the true answer here. Most importantly: Students should research and contact each school they are interested in attending to understand the complete view of fees and costs associated with earning an online degree in Alabama, beyond just tuition rates. Students who are interested in studying at online colleges in Alabama may need a little help with covering the cost of their degree programs. In addition to taking advantage of federal financial aid (FAFSA), they can take advantage of scholarships. Here are a few scholarships available to prospective online college students in Alabama. Korean American Scholarship Foundation Scholarship – Southern Region: This scholarship is available to high school seniors in Alabama who have a 3.0 grade point average and plan to attend college the following year. The college they attend must be in the South. MetLife Foundation Scholarship: Students in Alabama who are pursuing a bachelor’s degree in certain areas are eligible for this $2,000 scholarship. The degree areas they must be pursuing range from sales and marketing to mechanization and plant pathology. William Verbon Black Scholarship: This scholarship is available through the Alabama Law Foundation. Priority for this scholarship goes to Alabama residents who are high academic achievers and possess a strong track record of civic involvement. Every prospective college student comes into their higher education journey at a different starting point. One initiative that compliments a college or university education in Alabama are Adult Education programs and the Workforce Innovation and Opportunity Act by the U.S. Department of Labor. Bridging the transition to earning a college degree. Alabama community colleges often host Adult Education programs to prepare college-bound students with Transition Programs or GED Exam courses. Transferring to a 4-year college. Educational Opportunity Centers provide college counseling services for Alabama students who want to advance their education. Earning work experience after graduation. The Alabama Works! program helps many recent college grads obtain the entry-level work experience they need to move into more competitive jobs. In 2017, nearly 20,000 people across Alabama participated in adult education programs.